According to an official post, the Securities and Exchange Commission of the US issued a cease and desist order to Crypto Asset Management (CAM) as well as its founder Timothy Enneking. The SEC has also fined the company and its founder $200,000 for misrepresenting itself as the first crypto asset fund that is regulated in the US. The company used this claim to raise $3.6 million in funding from 44 different investors last year, taking CAM’s net asset value up to $37 million. According to mainstream media, this is the first time that the SEC has taken disciplinary action against a crypto asset fund. Bitmain may be facing fresh competition in the form of Bitewei, a mining chip maker based in Shenzhen and led by Yang Zuoxing. Zuoxing is an ex-director of design at Bitmain. The new mining equipment maker has already raised 140 million yuan (~$20 million) to create cryptocurrency mining equipment for the industry. Bitewei is now considered my many in the industry to be much more energy efficient that any of Bitmain’s products. If the test results published by Bitewei are anything to go by, then the new WhatsMiner M10 is about 30% more efficient than Bitmain’s AntMiner S9 Hydro. Read about this story here. According to local news media, law enforcers from the two US states of Arizona and Illinois have requested the Criminal Investigation Division (CID) of India to seize BitConnect’s properties in the country. BitConnect, a Bitcoin investment company, had stopped its operations in January of this year after it was accused of being another scam. This open-source cryptocurrency and investment program was offering a multi-level referral program and was promising massive returns on investments to its customers. 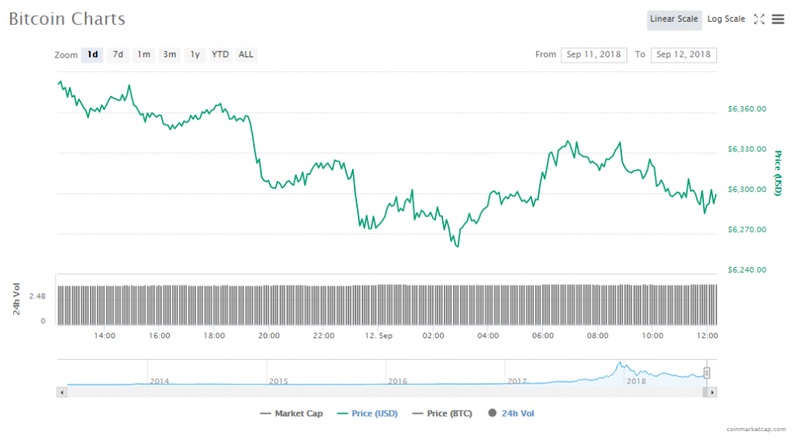 The crypto market’s trading volumes increased by $0.56 billion to $11.50 billion since yesterday. 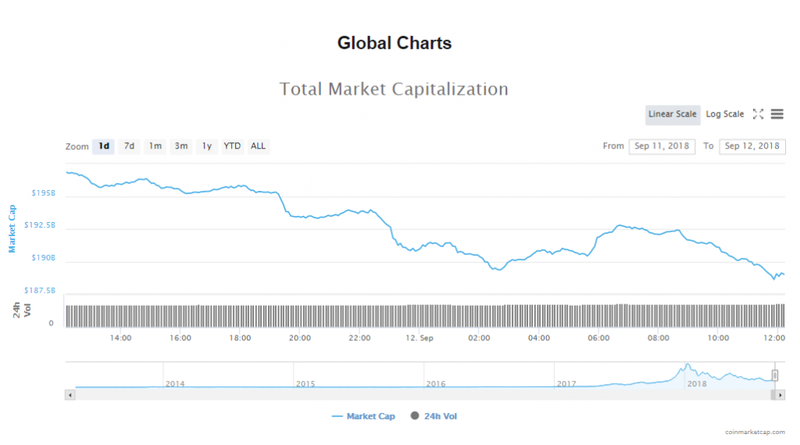 The valuation of the crypto market is $189.37 billion dropping slightly from the previous day. Bitcoin’s current token price is $6299.04, a 1.31% fall in the last 24 hours. The market cap of the cryptocurrency is $108.72 billion and volumes of trading went up slightly to $3.88 billion. Ethereum’s current price is $177.49, which is a 9.71% drop in the last 24 hours. The digital token’s market valuation is $18.15 billion and its volumes in trading are at $1.60 billion. While most of the top ten cryptocurrencies saw massive falls in their token prices, Stellar was unusual in gaining 0.46%. The biggest losses were experienced by Cardano, which dropped by 11.29%, followed by Ethereum, which plunged 9.71% and Bitcoin Cash, which nosedived by 9.60%. Bitcoin’s token price is trading at $6299.04, falling 1.31%. The valuation of the crypto is now $108.72 billion. Ethereum’s token price is trading at $177.49%, falling 9.71%. The valuation of the crypto is now $18.15 billion. Ripple’s token price is trading at $0.260800, falling 3.68%. The valuation of the crypto is now $10.35 billion. Bitcoin Cash’s token price is trading at $427.74, falling 9.60%. The valuation of the crypto is now $7.41 billion. EOS’s token price is trading at $4.90, falling 3.05%. The valuation of the crypto is now $4.44 billion. Stellar’s token price is trading at $0.194314, climbing 0.46%. The valuation of the crypto is now $3.64 billion. Litecoin’s token price is trading at $50.54, falling 7.08%. The valuation of the crypto is now $2.94 billion. 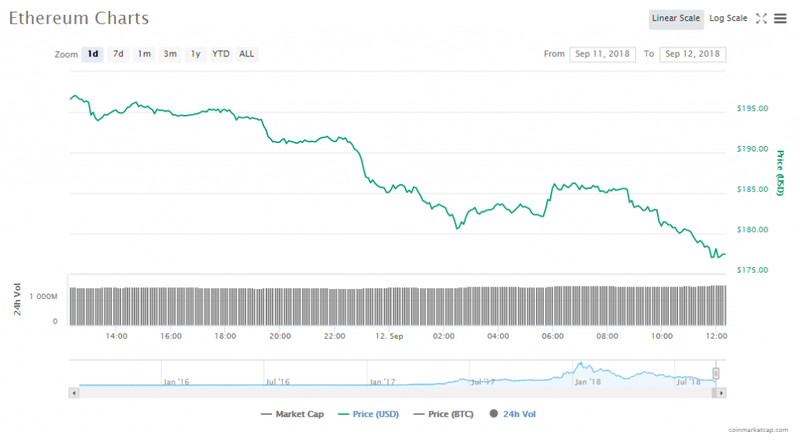 Tether’s token price is trading at $1, falling 0.11%. The valuation of the crypto is now $2.76 billion. Cardano’s token price is trading at $0.065579, falling 11.29%. The valuation of the crypto is now $1.70 billion. Monero’s token price is trading at $102.21, gaining 5.69%. The valuation of the crypto is now $1.67 billion. Valentine’s Day was a good day for Litecoin. While mostly all major crypto assets did well in the market, Litecoin was by far the biggest gainer. The altcoin’s price shot up by more than 30%. The NEM Foundation is charting out a survival plan after it successfully grabbed a funding injection of around $8 million. The figure, in particular, was obtained by the organization last month, the same month it decided to lay off most of its entire workforce. The United States Department of Justice (DOJ) has accused seven of Russia’s Main Intelligence Directorate (GRU) of have conducted global hack attacks as well as other misinformation activities. According to the DOJ all these attacks have been funded by cryptocurrencies. The indictment has been filed by a grand jury at the Western District of Pennsylvania this week. According to local news agency reports, Wei Kai, China Academy of Information and Communication Technology’s (CAICT) head of Blockchain research Wei Kai stated that the use of Blockchain technology in the financial industry still faced a lot of challenges.